Struggling with string floss is one of the most frustrating parts of oral hygiene – you never seem to rip off the right amount, your fingers aren’t nimble enough to reach the back corners of your mouth, you’re not really sure if you are doing it properly, and heaven help you if you have braces or some other form of orthodontia! Thankfully, advances in technology have now created an excellent replacement for string floss with the Waterpik WP-660 Aquarius Professional Water Flosser. 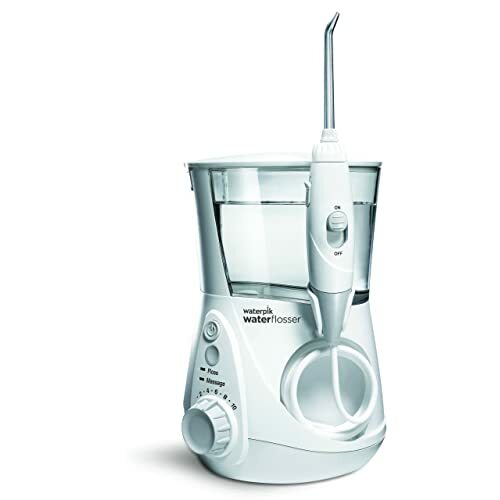 The Waterpik Aquarius Professional Water Flosser is a high-tech and effective replacement for string floss – every component of this product has been designed for ease-of-use and effective plaque removal. 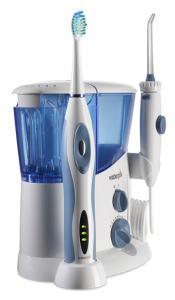 We love Waterpik anyway, because if it weren’t for this unit, they’ve also got our second choice for the top rated flosser! 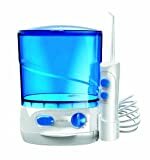 Who is the Waterpik Aquarius Professional Water Flosser Intended For? This professional water flosser can definitely be used by anyone – its exceptional ability to remove plaque and maintain gum health is something that everyone can benefit from. However, its ability to work around areas that are hard to reach with traditional flossing methods make it an ideal solution for those struggling to keep braces, permanent wire retainers, implants, or crowns clean. What are the health benefits of using the Waterpik Aquarius Professional Water Flosser? Numerous health benefits come from using the Waterpik regularly. Aside from your mouth feeling incredibly clean, the makers also guarantee that you will experience healthier gums within 14 days of use. As well, the Waterpik is shown to be far more effective at removing plaque and bacteria from hard-to-reach places, such as under the gumline, around braces, or between teeth than string floss. 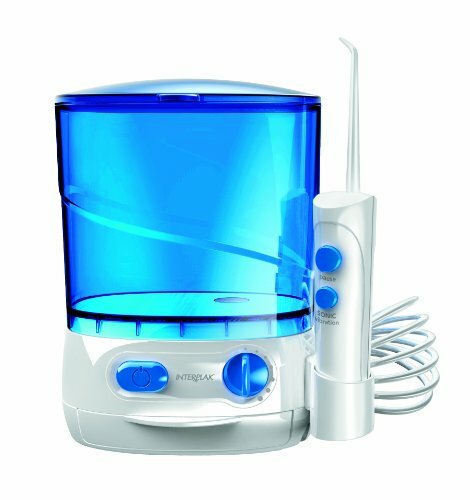 What sets the Waterpik Aquarius Professional Water Flosser Apart? Not all water flossers can boast the level of individual customization that the Waterpik Aquarius can. 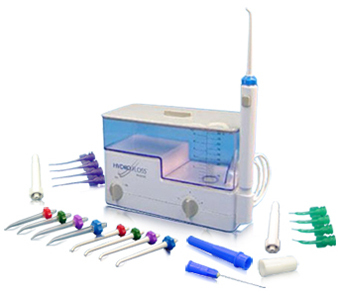 This model comes with seven unique tips (including tips specific to orthodontic hardware, tongue cleaning, and plaque removal) and ten pressure settings. These customizable options ensure that no matter what kind of flossing task is required, the Waterpik will be able to rise to the challenge. The Waterpik even goes beyond flossing, with a second hydro-pulse massage mode mode allowing the user to clean their gums and improve gum circulation. 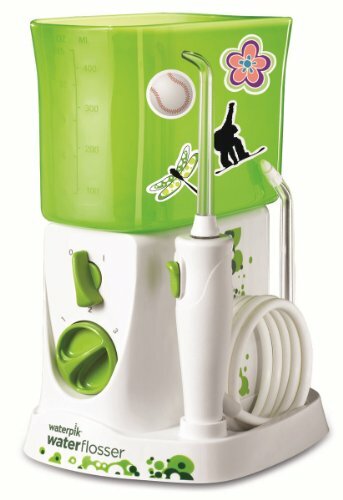 How User-Friendly is the Waterpik Aquarius Professional Water Flosser? The Waterpik’s design was created with the user in mind – it even includes a 1-minute timer (with an alert at thirty seconds) to help users clean their teeth and gums effectively and for the appropriate amount of time. 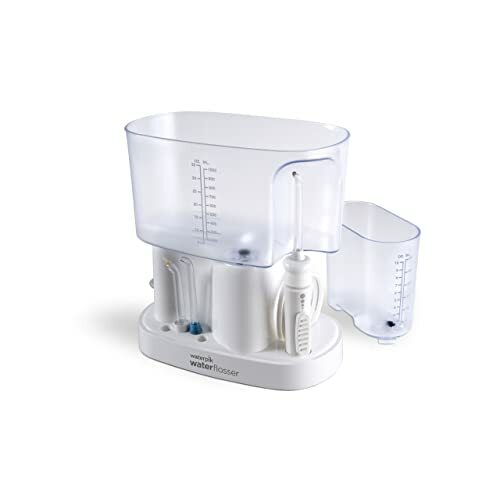 The Waterpik has a covered water reservoir with a 90-second capacity – more than is needed for a typical flossing session. 360-degree tip rotation ensures that you will be able to reach every corner of your mouth, and an easily accessed on/off switch on the body of the Waterpik itself gives the user complete control over its use. A three-year warranty is included with this purchase, guaranteeing a purchase free-of-worry. How do customers feel about the Waterpik Aquarius Professional Water Flosser? Criticisms of the Waterpik are few and far between. Certainly, at $79.99, you are paying a little bit more than the going rate (but don’t forget to check Amazon because you can usually get a MUCH better deal there). 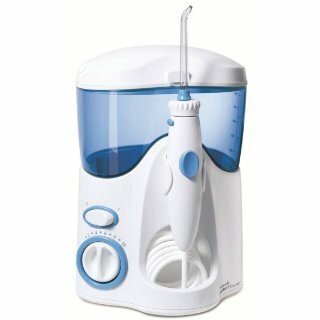 Some feel as though the primary difference between the older Ultra model and the new Waterpik Aquarius is the streamlined appearance of the Aquarius – something that is often quite important, as the Professional Water Flosser will probably be sitting out on your bathroom counter most of the time. Customers really appreciate how nice the updated Waterpik Aquarius looks, and the re-design also allows for some more practical modifications. For example, the lid flips up instead of needing to be completely removed, as it did in the Waterpik Ultra. This allows for easier access to the water tank, with less risk of a mess. This compact model is incredibly non-obtrusive. It measures in with a slim footprint of 4 ¾” by 3 ¾”, with an extensive hose and is relatively quiet while operating. The water supply cord is also easily stored within the body of the machine, keeping your counters clear. It is easily cleaned with white vinegar and water, and this is only required once every month or so (although the tank should be emptied after every use in order to keep the reservoir and pumps as clean as possible). The streamlined design has led to a significant decrease in weight, but in doing so some of the Aquarius’ storage capabilities have been limited. While the older Ultra model allowed for all of the exchangeable tips to be stored in the unit, only two are able to be stored in the new Waterpik Aquarius. The vast majority of those who use the Waterpik Aquarius are overwhelmingly happy with its primary purpose – its flossing capability. Glowing reviews abound as to the difference that the use of a professional water flosser have made in their daily mouth-care routines and yearly dental checkups. It is common for dentists and dental hygienists to remark on how improved their patients’ tooth and gum health is after they begin using the Waterpik Aquarius. It is also possible to use the Waterpik with your favourite mouthwash – an extra level of customization that can make your nighttime and morning routines that much smoother. The timer is an excellent additional feature, as it gives users peace-of-mind regarding the quality of their teeth-cleaning session. Using an on/off switch (instead of a button) gives the user some extra security in knowing that they will not accidentally spray themselves or others by inadvertently turning the Waterpik on! Additionally, the ten different strength settings are easy to distinguish between, and allow new users to begin wherever is comfortable and slowly work up to the stronger settings. 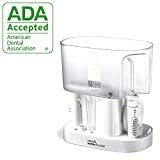 Thankfully, the transition from a Waterpik Ultra to the Waterpik Aquarius Professional Water Flosser is a smooth one – the detachable heads from the Ultra fit easily on to the Aquarius and vice-versa. Make sure to read the easy-to-understand owner’s manual carefully – some of the features may not be immediately obvious, and you do not want to go without a single one of them. It seems like it doesn’t matter what you do – every year, when you go in for your annual dental checkup, the dental hygienist will chastise your flossing. Flossing is an essential part of oral hygiene, but it can also be very difficult to do correctly – especially with the classic string floss. While water flossers such as the Waterpik Classic Professional Water Flosser are not a replacement for string floss (the two mechanisms work quite differently when it comes to their methods of plaque and bacteria removal), they are incredibly effective at removing plaque. In fact, in three seconds of water flossing up to 99.9% of plaque is removed from the teeth and gums. 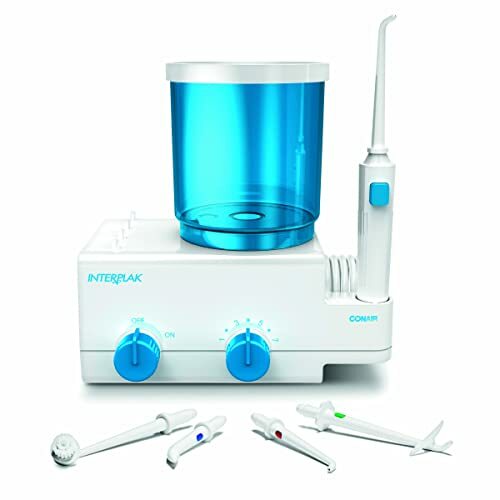 At a very affordable price of $49.99 on Amazon, the Waterpik Classic Professional Water Flosser is a cost-effective dental tool that will help to maintain oral hygiene and prevent future oral health complications. Who is the Waterpik Classic Professional Water Flosser intended for? The Waterpik classic is a tool that can be used by everyone, regardless of their current dental health. However, it is of particular interest to those who have dental conditions that currently complicate their daily routines such as orthodontic interventions. As well, the Waterpik classic is set apart because it is designed with a specialty reservoir intended for antimicrobial rinses. These rinses are perfect for helping to combat gum disease or periodontal pockets, and can make a significant difference in treatment. What are the health benefits of the Waterpik Classic Professional Water Flosser? This device makes a significant difference in the amount of plaque removed during routine dental cleaning. The Waterpik Classic boasts an impressive three-fold increase in plaque removal around braces when compared to string floss alone. Similarly, clinical trials have demonstrated a significant increase in gum health around dental implants. The Waterpik Classic also works to make sure bacteria is removed from both teeth and the gumline. Waterpik really believes in their product – they offer a guarantee on users achieving healthier gums within 14 days of beginning to use this product regularly. What sets the Waterpik Classic Professional Water Flosser Apart? The design of the Waterpik Classic is perfect for those who do not want an overly fussy professional water flosser. This design has a high-volume reservoir that boasts a 90-second water capacity when set at the maximum level of water pressure. Six different settings allow the water pressure to be adjusted directly from the handle – making it efficient to switch between them depending on the area being cleaned. Three tips are included with purchase of the product, including two classic jet tips (so multiple people will be able to make use of this device) as well as a single Pik Pocket Tip which helps to target the water stream below the gumline in order to fight bacteria that is often missed by toothbrushes or string floss. The additional reservoir for antimicrobial rinses is another bonus feature that showcases Waterpik’s dedication to promoting excellent gum health. A two-year warranty is offered on the Waterpik Classic. How User-Friendly is the Waterpik Classic Professional Water Flosser? The Waterpik Classic offers considerably fewer options than many of the other water flossers currently available – there are only six power settings and three tips available. 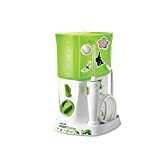 The inherent simplicity of this design, however, makes up for the fewer choices available, especially as it does not affect the quality of the Waterpik Classic’s cleaning ability. This model does offer 360 degree tip rotation, which ensures that all areas of the mouth can be cleaned, no matter how difficult they may be to access with string floss. Users can even use their favorite mouthwash instead of water in the reservoir, for an extra clean sensation. As well, the secondary reservoir specifically for antimicrobial rinses is an added bonus for those particularly concerned about an existing gum condition. 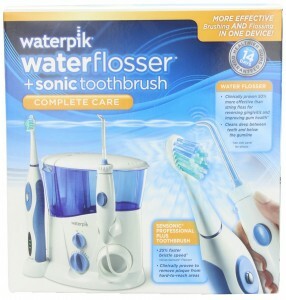 How do customers feel about the Waterpik Classic Professional Water Flosser? 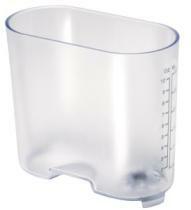 Customers have had very few complaints about their experiences with the Waterpik Classic. Instead, reviews overflow with testimonies about the incredible differences that the Waterpik has made in their oral health through daily cleaning sessions. These comments are echoed especially by those with braces or dental implants. The design of the Waterpik is angled more towards function than fashion although the unit is unassuming, and will blend in well on most bathroom counters. The larger reservoir is very useful for extended cleaning sessions, and has other unexpected benefits as well – many users enjoy that the larger reservoir can be inverted and placed over the rest of the unit, protecting it from dust or other contamination. Set up is easy, and a guide is included with the packaging to ensure that users do not have any difficulty using the product immediately after a short calibration. The unit is easy to clean and maintain, although it does not have a separate cover for the reservoir, so it is necessary to empty it after each use in order to prevent dust from landing in the water. The only caveats that were expressed by users were quite minor – some found that the Waterpik Classic was slightly more noisy than they had anticipated, although they quickly adjusted to the volume. Others noted that the pause button on the handle could sometimes be difficult to fully depress, causing some water to continue to spray out. Some users do find that they have had superior water flossers in the past in regards to sheer power, however they readily admit that the Waterpik Classic is a smaller-budget model, and that for the much-reduced price it offers excellent results. The ease of use of the Waterpik is also something that users are enamored with – there are no complications involved with using it. These issues are minor, however, especially given the low price of this unit! User after user expressed their amazement at how effective the Waterpik classic was the first time they used it, and the improved health of their teeth and gums at their next dental appointment. 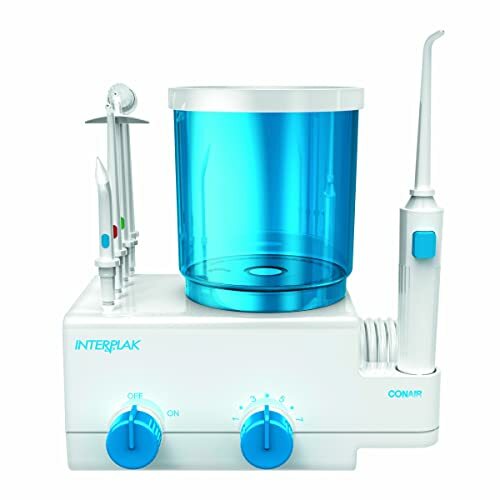 The Interplak All-In-One Sonic Water Jet System produced and released by Conair is a domestic dental health care unit especially designed to help improve and preserve oral hygiene easily and quickly. The system claims to be very effective in cleaning bacteria and plaque and removes food residue away from all the places a toothbrush or dental floss can’t reach: around implants, splints and crowns, removable and fixed bridges and any kind of orthodontic appliances, while at the same time gently massages the gums. 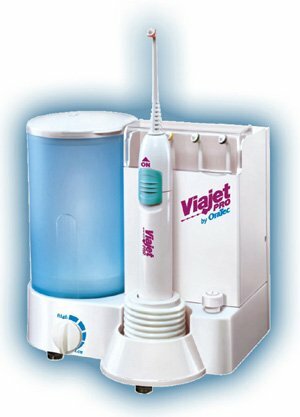 Its unique design aids the maintenance of immaculate oral health in a pleasant, quick and effective way. No matter how composite one’s oral hygiene is, no matter how high one’s needs are, the Interplak manufacturers state that it will get the job done, despite the potential complexity of one’s dental work. As a result, the Interplak water flosser prevents gum disease and gingivitis by flushing away harmful bacteria without any risk of injuring the gums. Other features that Interplak has to offer include a 7-setting water pressure control, from gentle to strong, so one may choose the desired setting. It has a reservoir of large capacity to avoid constant refilling. It has a pause control on the handle in addition to the on/off button, as well as a sonic button that controls vibration. The Interplak differs from other products currently in the market as it offers complete dental care rather than being a supplementary tool. Its’ exclusive specialized tips (the massage and brushing heads) can be used with or without water. Thus, the 4,500 water pulsations can be combined with 12,000 sonic movements. Dental care professionals recommend multiple daily practices to maintain oral hygiene. Engaging in all of them requires the purchase of many different products, raising the costs, taking much countertop space, and time. The All-In-One Interplak combines flossing, brushing and massaging, which makes it cost-effective and convenient. Interplak costs as much as most regular, full sized water flossers, if not less. With about 175 reviews, users on Amazon are generally happy with the product even after extended use, and give it a solid 4 stars. We were shocked to see the nearly 5,000 reviews on Amazon from users of the Waterpik, and even more surprised to see that even with all of those people, it still has a very high 4.4 out of 5 star rating. We have found that Amazon ratings are a very good way to measure the quality of a product, and over 3,000 perfect ratings simply can’t be wrong! So, other than being one of the top, best selling flosser you can buy, it is the only one that can legitimately claim to be 50% more effective at improving gum health than plain old dental floss. They have commissioned studies to be able to make that claim, and you can tell after using the unit just how good it is, because you’ll come away with a totally refreshed feeling in your mouth that brushing, flossing, and even mouthwash can’t deliver. We liked that this comes with 6 different tips, which are all able to store easily on top of the water reservoir in a small lid compartment. They’re kept out of the way, but easy to access for whatever you need. For maximum versatility, not only do you get a wide array of different tips, but the Waterpik Ultra also has 10 pressure settings, so no matter who you are or what your needs are, you should be able to find a set up that works for you. This is one of the best units there is when it comes to versatility and we are big fans of products that allow for quality use by the most amount of people. There’s more of a chance this will work for you, plus it’s great for households that have multiple people using the unit, all who have differing needs. We really liked the fact that it has an easy to use pause button that allows you to stop the flow of water when you press it. This is good for not making a mess if you need to remove it from your mouth, or if you are changing from top teeth to bottom teeth. Solves that problem of extra water getting everywhere. Another great feature is the nozzle swivel. Unlike other units where you have to move your hand and arm around to get in all the different places, with this Waterpik, you simply turn the nozzle head with your fingers on an easily-maneuverable swivel. It’s much easier to use than some models and it’s just nice to have something that should be a common sense addition to any unit. The Ultra wins on all levels and as a water flosser in general, it really was the best until it was improved upon even more! We, along with most of its users, highly recommend it as your choice for oral irrigator. Top level, you simply will not find many better units than this to meet your needs and the needs of your family. The three year warranty should help, too. 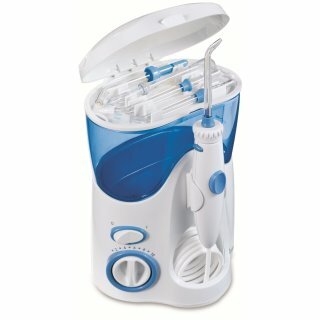 The Waterpik Ultra Water Flosser is one of our top choices, and we hope you check it out for yourself.